Katie Holmes has been asked quite a lot by the media about her relationship with Collateral actor Jamie Foxx. Speculations have been doing rounds on the internet as to whether Foxx and Holmes are actually in a relationship or if they are just friends. Every time the duo deny about their relationship, we hear several insider sources all laying claim to the fact that Holmes and Foxx are actually a couple and have been so for years now. Recently, rumors about their alleged relationship were at all-time high due to the supposed divorce agreement between Holmes and her ex Tom Cruise. And then the rumors set the ground for more rumors about their engagement and marriage with later rumors even talking about pregnancy. 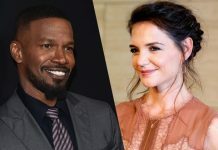 Looks like all speculations about Holmes and Foxx’s relationship have been put to rest because Katie Holmes and Jamie Foxx are apparently done answering questions on the subject. Moreover, Katie is now busy chasing her next career move – filmmaking. Katie wants to get better at filmmaking and she is now concentrating on her role as a filmmaker. Holmes got the first glimpses of the directorial world behind the camera for the film “All We Had”. The time she spent behind the camera sparked her interests in the field of filmmaking. And now, she’s taking on the role of director for a new project titled “Rare Objects”. She has spent over a year preparing for her directorial debut. She’s also set to direct one of the episodes from the upcoming season of “The Kennedys”. Katie loves her daughter Suri Cruise a lot and she never misses a chance to express her love for the adorable kid. Her directorial debut is more about Suri than it is about her. “My daughter and I are very, very close. She helped me when I was preparing for it. We have a good time together. It’s more about her than me. It’s my first feature, and when she’s older, I thought it might mean something to her that, yeah, of course I thanked you. She’s my number one”, Katie said.